Woo-hoo! Survived my first reloads! Results not exactly stellar though. All rounds chambered and fired but more than half stove piped (if that's the correct term) or simply remained in the chamber. Those that did eject did so without the same force as all of the factory loads used before. I usually place a towel on the bench in front of me while shooting and noticed powder on it for the first time. The group size on the other hand actually improved. I know you guys are going to tell me not use the Unique and that's fine but I wanted to start out with that to ease my first time jitters. So, what to do now? Should I chuck the Unique and move onto Bullseye or AutoComp powder? I have both. Was the load used too light and that's why the stove piping or weak ejections? What type of bullets are recommended? I have all of the .38 Special wadcutters you guys recommended earlier but failed to ask about the .45 bullets. So, I just picked up locally some of the bullets mentioned above and some 200 gr. plated round nose bullets to get started. I have some comments and observations about the Dillon XL 650 but will post those in another thread. Re: Woo-hoo! Survived my first reloads! Results not exactly stellar though. Sounds like it's too weak for the springs currently in your gun. Move up to 5 grains of Unique. The Max for a jacketed 200gr is 7.3gr and 200gr LSWC max is 5.4. When using plated bullets you don't load as hot as jacketed. Try the 5.0gr Unique and retest. For bullets, I use cast 200gr LSWCs. I find they are plenty accurate and really cheap. Rob Kovach wrote: Sounds like it's too weak for the springs currently in your gun. Move up to 5 grains of Unique. The Max for a jacketed 200gr is 7.3gr and 200gr LSWC max is 5.4. When using plated bullets you don't load as hot as jacketed. How do you tell the difference between jacketed and plated bullets? The ones I bought didn't have a box. I just got a small quantity from their stock box. ^^I totally agree with Mspingeld, and beeser and I talked about spring changes for the future. Meanwhile, we just want to get beeser comfortable with reloading as a process. To tell the difference between jacketed and plated ammo: you should be able to cut through the plating with your pocket knife fairly easily. Jacketed rounds are difficult to cut through. Rob Kovach wrote: ^^I totally agree with Mspingeld, and beeser and I talked about spring changes for the future. Thanks again Rob! The copper coating was more difficult to scrape off than expected so these may be jacketed bullets. Does this change the powder load? I'll find out for sure about the type of bullets tomorrow when the gun shop that sold them to me is open. And yes, we need to get Beeser more comfortable with the reloading process. I should have taken a picture of my attire when reloading. You would've thought I was a member of the bomb squad. beeser wrote: The copper coating was more difficult to scrape off than expected so these may be jacketed bullets. Does this change the powder load? Kinda. Jacketed bullets need more juice, but we aren't loading for maximum power, we are loading for manageable recoil at this point. I still want you to try 5.0gr Unique for your next "batch". We know the load is strong enough when it locks the slide back on the last shot 9 out of 10 times and cycles reliably all of the time. beeser wrote: I should have taken a picture of my attire when reloading. You would've thought I was a member of the bomb squad. I don't agree that jacketed bullets "need" more powder. They certainly can take more powder/velocity than cast or swaged bullets. But you don't need it for accuracy in the .45. I have shot many thousands of 185 and 200 JSWC's over 3.8-4.3 gr of bullseye with great accuracy. The guys using cast bullets are on the same load. I only meant they need more to cycle beeser's gun. You are 100% correct Dr.Don. OK, I just finished loading 50 more at 5.0 gr. of Unique. I might head out to the range a day early to try them out. Incidentally, what's with the powder that I mentioned at the top of this thread? I'm getting some on the towel that I place on the bench. Is that unburnt powder? a real light load doesnt always burn fully. that will leave a lot of unburned powder I bet with the 5 gr load most of that will stop. Besides the load being light, are you sure about the crimp. Here's a suggestion. When you start out working on a new load, just load 5 rds at the lowest powder setting you think is worth trying, 5 rds at .2 grs more, 5 rds at another .2 grs more and so on. Make sure to keep them marked and then take them all to the range. That way you can test your gun and find how much powder you need to at least get your gun to cycle well. If you can actually feel the slide moving or see it moving back and forth, you need more powder. That at least gives you a floor. Then you can start adjusting from there to find the best accuracy. Also, if you don't own a bullet puller, you should invest in one. STEVE SAMELAK wrote: Besides the load being light, are you sure about the crimp. Not real sure but what I did was adjust the crimping die downward until the cartridge would just fit in the case gage. Is that correct? swissyhawk wrote: Here's a suggestion. When you start out working on a new load, just load 5 rds at the lowest powder setting you think is worth trying, 5 rds at .2 grs more, 5 rds at another .2 grs more and so on. Make sure to keep them marked and then take them all to the range. That way you can test your gun and find how much powder you need to at least get your gun to cycle well. If you can actually feel the slide moving or see it moving back and forth, you need more powder. That at least gives you a floor. Then you can start adjusting from there to find the best accuracy. Also, if you don't own a bullet puller, you should invest in one. Good idea. I probably should've done that instead of loading all of the last 50 rounds with 5.0 grains. Yes, the bullet puller is already on my list of stuff to get tomorrow. I'm also going to get an electronic scale, knob for the powder bar adjuster, maybe a powder trickler if I can remember why it was a good idea to get one, 1" die wrench, funnel for returning powder to the appropriate container, check weights, and more. Some say that the proper crimp is critical to an accurate round. I set the crimp die to give a diameter at the mouth of the case of 0.469. I don't know if that is the optimum but you could start there. Your base setting of your crimp die is a starting point, but you still need to measure the crimp. To do that you need to measure the brass right at the very edge of the case mouth. .469"-.470" is a slight/no crimp where .467-.468 is a tightish crimp. I run a .468 crimp. I didn't want Beeser to start working on ladders yet. I want him to make small batches without making changes until he masters the process. I don't think he has a reloading mentor near him so I didn't want to flood him with too much information. I just measured some of my finished cartridges and get .472". The case gage has an inside diameter of .4725". The book has it at .473". Not tight enough? You're right Rob, no mentor here - just you guys. Did I say thanks lately? No. Turn the crimp die down a 1/4 turn and re-measure. You can use a round that you have already made also. Jacketed bullets have lead exposed on the base. 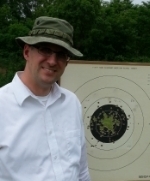 Generally, plated don't give the accuracy at 50 yards that bullseye shooters need. A good lead 185gr or 200 gr will be more accurate. I fired the 50 rounds of .45 acp, (185 gr. with 5.0 gr. of Unique) this morning and noticed some case ejection improvement but the work doesn't seem to be complete. I usually shoot 5 rounds in a magazine and this time the last round would consistently not eject. That was for about 6 strings but then the casings began stove piping more frequently, usually every other one. I'm also still getting unburnt powder droppings but it seems a little less than before. And incidentally, the bullets are X-Treme 185 gr. brass plated. The guy at the gun store said that the brass plating was a little thicker than most and could be loaded to either plated or jacketed specs. I'm just assuming that you started by looking in a reloading manual first. Most plated bullets function fine when loaded to lead specs. Yup. The manual was consulted.